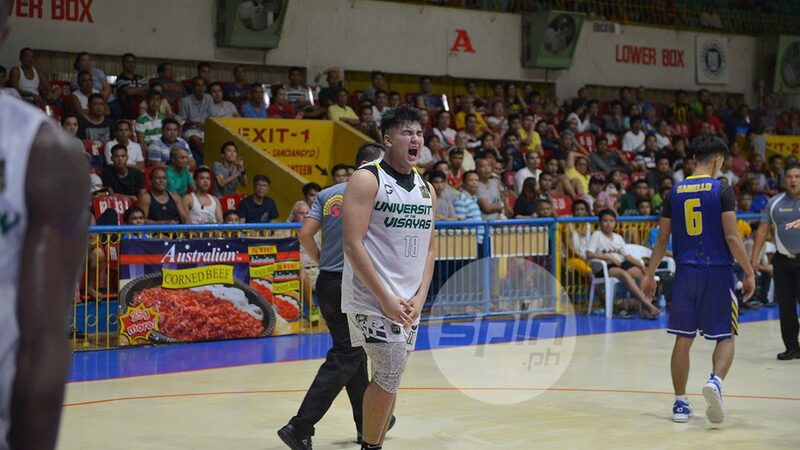 CEBU CITY – The University of the Visayas Green Lancers booted out bitter rivals, the University of Cebu Webmasters, 64-62, in the Final Four to keep their “three-peat” bid alive in the 2018 Cesafi men’s basketball tournament on Saturday at the Cebu Coliseum. Former league MVP Rey Anthony Suerte led UV with a near double-double of 21 points and nine rebounds while rookie Jafet Claridad added 12 markers, eight coming in an strong finish to the third that turned a 32-34 deficit into a 46-41 lead for the Green Lancers. Veteran wingman, Josue Segumpan, who just became a father, added 11 points, four rebounds and four assists. The Webmasters pulled to within two, 59-61, after a short jumper in the lane by forward Peter Paul Codilla, time down to 1:13. The Webmasters actually had a couple of chances to take the lead but Darrell Shane Menina, who was nursing a fever, missed two straightaway triples, while UV guard Gileant Delator split his charities for a 62-59 lead, 32.8 seconds left. On their next offensive, UC found Dacalos whose baseline triple fell short. The ball returned to the Webmasters after UV forward Jancork Cabahug touched the ball last during the looseball scramble. Menina’s potential game-tying triple from the right wing then fell short and UV wingman Josue Segumpan booked the Green Lancers’ ticket to the best-of-three championship with two made free-throws with 6.2 seconds left. UV will be taking on the University of San Jose-Recoletos Jaguars in the finals with Game One slated on Thursday. Senior guard Justine Dacalos, playing in his very last collegiate game, left it all on the floor and tallied 24 points, nine rebounds and three steals. John Jabello added 14 before fouling out in the fourth. The missing link however, was Cameroonian forward Frederick Elombi, who had just seven points on 3-of-12 shooting. He did have 14 rebounds, a steal and four blocked shots.